A motorcyclist with a stolen ring walks into Rothiemurchus Forest until he finds a quiet place to die. A woman with an eventful past has signed the Official Secrets Act and gone to Dumfries to forget a man and keep out of trouble. In comfortable Crieff, a retired historian publishes an obscure article on the survival of the Stone of Destiny then has his throat cut. A man with a long blade in a tan holster under his suit, a fondness for bird-watching, and memories of his short-lived Punk band Anger Management, has taken a commission to retrieve an object so valuable and mythic it might not exist. A rugby-playing half-Maori named Leo Nagotoa stands in the sleet by Romanno Bridge in the Scottish Borders, trying to thumb a lift when his Destiny slithers up alongside him. The hunt for the crowning stone of the Dalriadic kings, the Stone of Scone - is worth enough to make life cheap for some and dear to others - has begun. Some of the cast of The Return of John Macnab are back, but the times and the mood have changed. 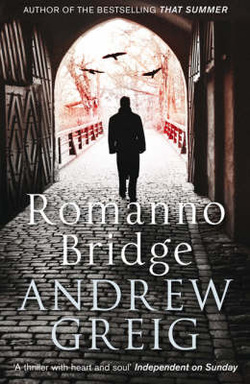 Romanno Bridge is a wintry thriller, an entertainment, a quest and an exploration of contemporary themes of fakes, frauds, copies, and a struggle to find the Real Thing, wherever and whatever it might be. It is published by Quercus Books. To buy this book, or to find out more about the publisher, please click HERE.